If someone to were ask me what my favorite meal was, tacos would probably be my answer about half of the time. Why not all the time? Well, these things depend! Where am I, what time is it, what time of the month is it, etc. 1. Phat Fat: Too much? Sorry, couldn’t resist. Anyhow, the avocado is packed with monounsaturated fats which everyone seems to agree are “healthy” fats that can reduce the risks of heart disease and lower cholesterol. 2. Avoid the hormonal outburst: Avocados are full of a plethora of nutrients (vitamin B6, potassium,magnesium, vitamin E, folic acid to name a few) which are known to help regulate hormones. I am first in line for anything that helps me maintain balance here. 3. Buy conventional without the angst: The skin on avocados protects the fruit from pesticides and other chemicals. So if you are looking to be a skinny rich girl, eat the avocados, but skip the organics here without regret. 1. Bring the enchilada sauce and a quart of salted water to a boil and add the chicken. Poach for approximately 25 minutes or until the chicken is no longer pink in the middle (cut into it to check if you are nervous). While it is poaching work on the slaw and guacamole in steps 2-6. 2. Put the cabbage, sliced radishes and chopped cilantro in a medium bowl. 3. Whisk or shake together the lime juice, olive oil, vinegar, cumin and salt and pepper and then pour over the cabbage, radish and cilantro mixture. Toss and set aside. It will wilt down while you finish cooking (nobody likes a slaw that is too crunchy). 4. Chop the cilantro, jalapeño, shallot, tomatoes and garlic and place in a small bowl. 5. Scoop in the avocado into the bowl with vegetables. Check this out if you don’t know how to cut and avocado. 6. Add the lime juice, salt and pepper and mash together with chopped vegetables and avocado. Holy guacamole! 7. When the chicken is finished poaching, pull it out and let it cool for 5 minutes or so. Reserve about a cup of the poaching liquid. 8. Once cooled shred the chicken with forks. If you are not familiar with this technique check this out. It does a pretty good job of explaining it. 9. Put the shredded chicken in a bowl (or back in the original pot if you don’t want extra dirty dishes) and mix in the reserved poaching liquid (add it slowly, you want just enough to give it color/flavor and a bit of extra moisture, you may not need the whole cup). 10. 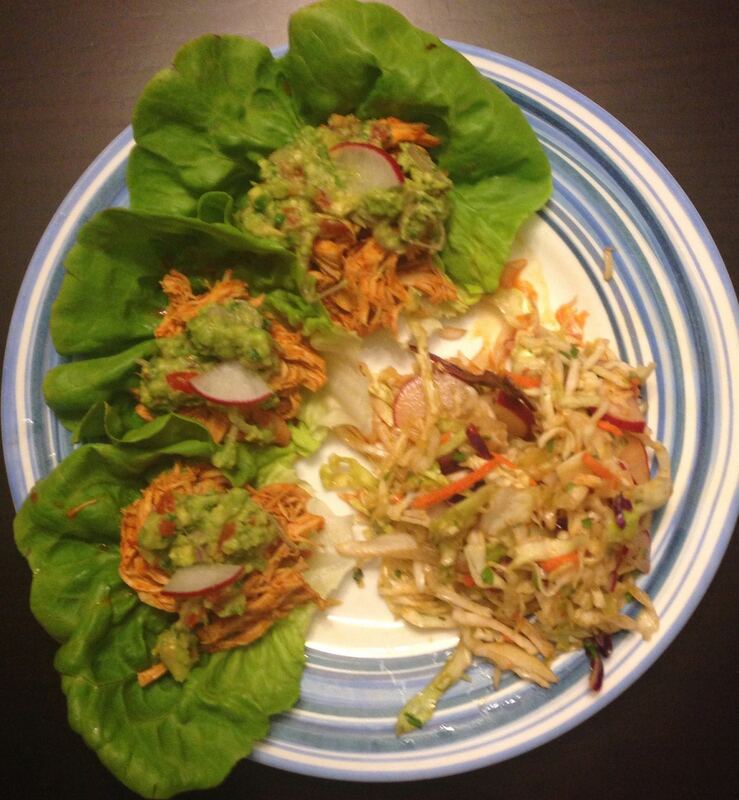 Spoon chicken into lettuce cups, top with guacamole and serve with slaw. Enjoy! Tags: 30 - 45 minutes, Avocado, Chicken, Gluten Free, Paleo, Summer, Under $5 / serving, Whole 30. Bookmark the permalink.